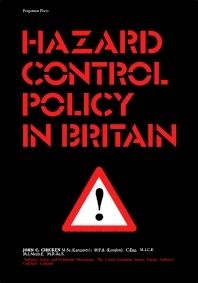 Hazard Control Policy in Britain examines the general nature of Britain's hazard control policy and the factors that appeared to influence its formation up to 1973, that is, prior to the implementation of the recommendations of the Robens' Committee on Safety and Health at work. Attention is directed mainly at identifying the apparent roles and goals of the various organizations associated with policy making. Comprised of five chapters, this book begins with an overview of the nature of hazards and their technical causes, as well as the risks to life that they pose. Hazard control policy is then considered and a model of the policy making process is postulated. The role of interest groups in the policy-making process is also analyzed. Case studies that give a clear indication of the general nature of the hazard control policy-making process are presented, covering road transport, air transport, factories, nuclear power reactors, and air contamination. This monograph should be of value to policymakers involved in hazard control.